British expats living in the EU are suing European Commission President Jean-Claude Juncker over his order to prevent informal Brexit discussions. Mr Juncker insists there can be no negotiations until the UK triggers Article 50 – the withdrawal process. The expat group wants immediate talks about the implications of Brexit for Britons living in other EU countries. UK Prime Minister Theresa May has pledged to trigger Article 50 by the end of March. But she also called for “preparatory work” with EU governments – before the official negotiations – to help smooth the process of UK withdrawal. The non-profit association Fair Deal for Expats has issued a legal challenge against Mr Juncker at the European Court of Justice (ECJ). The group alleges that his “presidential order” concerning Brexit discussions is an “unlawful gagging order” which “must be annulled immediately”. Mr Juncker and some other European politicians have warned against an “a la carte” deal for the UK which might encourage other EU members to cherry-pick EU policies, unravelling the rulebook. In a speech on 28 June, four days after the Leave campaign won the UK referendum, Mr Juncker said: “I have forbidden Commissioners from holding discussions with representatives from the British Government – by Presidential order, which is not my style. On Friday Mr Juncker insisted again that the EU must not compromise on free movement of labour during the Brexit divorce talks. It is among the EU’s cherished four freedoms – the others being free movement of capital, goods and services – that members of the EU single market have to respect. 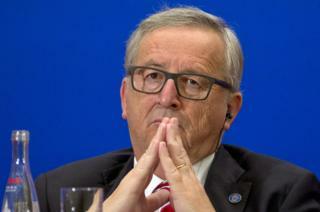 Speaking in Paris, Mr Juncker said “you can’t have one foot in and one foot out”. Many UK politicians want a deal that would allow the UK to keep key single market advantages while also limiting the numbers of EU migrants entering the UK.